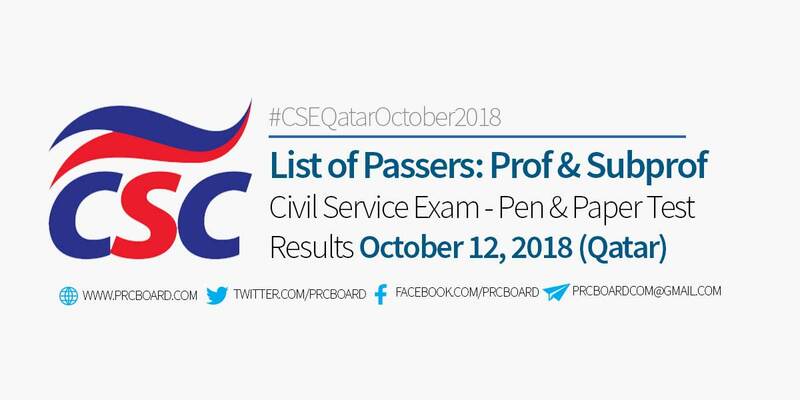 MANILA, Philippines – The October 12, 2018 Civil Service Exam results for Professional and Subprofessional levels held in Qatar including the list of passers, top examinees and related announcements will be available at this website as soon as the Civil Service Commission (CSC) releases the results online 60 days after the day of examinations. Below is the list of passers for October 2018 Special Civil Service Exam - Pen and Paper Test (CSE-PPT) for Overseas Filipino Workers (OFWs) in Qatar, Professional and Subprofessional levels, courtesy of CSC. The exams are administered by CSC on October 12, 2018 at testing centers located in Qatar. In the year 2016, the CSC conducted the exams to a total of 953 OFWs in Hong Kong and Macau. Civil Service Exam is an eligibility test to gauge the examinees' preparedness in working with the government. Passing the CSE-PPT is not the only requirement for working in the government. CSC reminded that aspirants shall meet the education, experience and training requirements needed for the position. Likewise, they will have to undergo screening processes by the selection board which might include interviews, written exams, among others. According to the CSC's examinees guide in taking eligibility tests, the target release date for the result of October 12, 2018 Civil Service Exam (Professional and Subprofessional) will be within forty (40) to sixty (60) days after the exams. CSC via its official social media channel is disclosing the estimated target release date of CSE results, few weeks before posting. Stay tuned here and at our social media pages for updates. Examination rating can be generated using the Online Civil Service Exam Result Generation System (OCSERGS) starting December 26, 2018. Those who pass the exams should verify with the CSC Regional Office the availability of Certification of Eligibility (CoE). Representatives are not allowed to claim the CoE. Claiming of the Certification of Eligibility will be issued free of charge by the Examination, Recruitment and Placement Office starting December 26, 2018. On the most recent CSE administered on March 2018, 25,602 out of 238,966 (10.71%) passed the Professional Level while 4,573 out of 40,821 (11.20%) hurdled the subprof level. On CSE-PPT exams conducted August 2017, 25,127 out of 228,917 (10.98%) examinees passed. 21,792 out of 196,819 passed in the Professional level while 3,335 out of 32,098 passed in the Subprofessional. During March 2017, 25,090 out of 219,679 examinees passed or an overall passing rate of 11.42%. 21,640 out of 188,528 examinees passed the Professional level while 3,450 out of 31,169 examinees passed in the Subprofessional. The CSE-PPT for Professional level covered 170 test items in 3 hours and 10 minutes while in Subprofessional test, 165 test items in 2 hours and 40 minutes. To receive up-to-date news on results of Civil Service Exam for OFWs in Qatar conducted on October 12, 2018, we advise our visitors to bookmark this page, visit PRC official website, follow us at our social media pages via Facebook and Twitter or join the members discussions at our Facebook Group. Thank God I passed the exam!! !